Imagine two of your favorite desserts from Jollibee, combined into a fruity and creamy cup of sundae goodness. Introducing, the smooth and milky soft serve vanilla sundae topped with the classic Peach Mango Pie from Jollibee- Jollibee Peach Mango Sundae. A sweet and refreshing cup of dessert that gives a whole new level of langhap-sarap experience. I've always loved Jollibee's Peach Mango Pie. If I had to choose my top favorites from the local fast food chain, the classic Peach Mango Pie would definitely be on the list. On the other hand, their vanilla sundae is our best bet especially on a hot weather day. When I heard of Jollibee's newest dessert, I cant help but feel giddy with excitement. Finally, a unique sundae flavor that matches my love for something sweet and fruity for my dessert. For only P29, you get the same sweet and fruity peach-mango filling from your favorite pocket pie, topped on Jollibee's smooth and creamy vanilla sundae. Enjoy your favorites at Jollibee and get a mini peach mango sundae for only P20 as an add-on to every value meal. 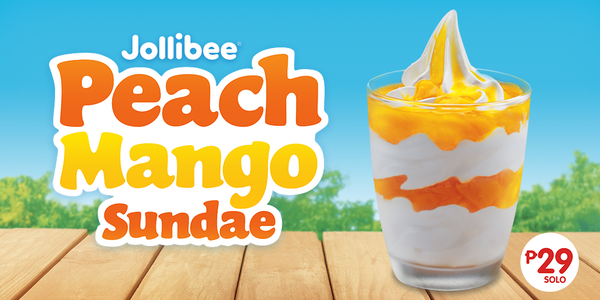 Jollibee Peach Mango Sundae is now available in all Jollibee branches nationwide!